As part of our effort to be prepared for everyday emergencies, we went on a hunt for the best cheap flashlight. Our target was a durable, inexpensive high lumen flashlight that we could give to children and not worry if it was lost. It needed to be a flashlight bright enough for a light source during power outages and lighting around the yard at night. There are a LOTS of cheap flashlights available, and many crazy expensive ones. Many flashlights require specialty batteries, which bumps up the cost. If your special batteries go dead, the light is useless. After comparing and testing an assortment of cheap flashlights, this is our recommendation for the “best flashlight for the money”. It is small, durable, bright, inexpensive, and multipurpose. Summary: We recommend the Kootek XPE-Q5 LED flashlight. It is a low cost, super bright LED light. It uses one AA battery or 14500 batteries which is not included. 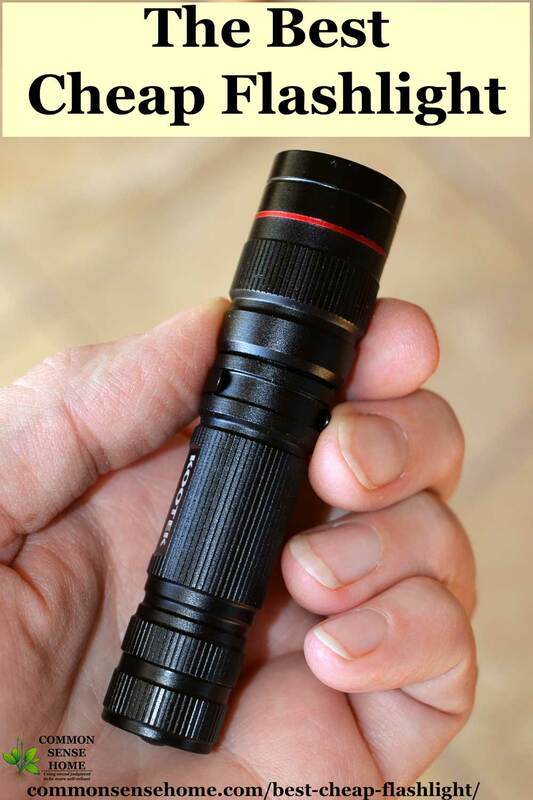 This zoomable, compact flashlight is water resistant (IPX6 compliant) but it is not waterproof. It is listed at 700 lumens but is more like 300 lumens and measurably brighter using a 14500 4.6v battery. The case is aircraft grade aluminum with a belt clip and a manual focus. The flashlights are about 3.7 inches (90mm) long x 0.83 inches (20mm) wide and weighs about 2.1 ounces (without the battery). It has 3 light modes – bright, dim, and strobe. We suggest you buy one five pack and test them out, and get more later. This is our choice if you need cheap flashlights in bulk. A 5 pack is only about $3 each and they use the widely available AA battery. Pros: Small, lightweight and powerful flashlight. It’s just the right price to leave them stashed around the house, in the car, and in emergency kits. Cons: It gets hot if the unit is left on “high mode”. It doesn’t have a seal ring. The adjustable focus goes from wide (where the LEDs are not visible) to a narrow beam of light (where the individual LEDs are visible). This is a pro and con as narrowing the focus increases the “throw” of the flashlight to at least 300ft (about 100 meters) but the visible LEDs may bother some people. Put your cheap flashlights in bedrooms, kitchen drawers and tool kits. Also, put a budget flashlight in each emergency kit, 72 hour kit, first aid kit, get home kit and bug out bag. If you or the kids lose one, you aren’t losing an expensive flashlight. We recommend three for every vehicle. I was on the way home and came across a deer accident. In clearing the road, vehicles were not slowing down. I put one flashlight facing traffic in each direction with strobe on, which did slow down traffic more than normal hazard lights. The Kootek is about 200 lumens so it is very bright with a fully charged AA and a bit brighter with a 14500 3.6v battery. The light color or hue is a fairly clean white and varies toward blue (known as “cool white”), however, given the variance in production each one might have slightly different color hues. You can see all the individual LEDs when it is not diffuse, as noted in the CONS above. The Kootek flashlight has a decent range (throw) of about 300ft (100 meters) fully focused. Although the LEDs are visible in the narrow focus, the brightness is just right for close tasks like pulling a sliver. The wide focus works better for a night-time tire change or lighting up a room. The strobe is disturbingly bright and is a good alternate to a road flare. The lower intensity is good for enough light to see your way around the house in the dark. When we first ordered a 5 pack of the Kootek we were suspicious that a flashlight under $5 would be any good. When we got it we were pleasantly surprised. The case feels solid. The three modes are toggled using the thumb button (tail cap) on the back. The flashlight doesn’t remember the last mode. Some advertisements say that they are 700 lumens (brightness). In testing it is actually about 200 to 400 lumens (depending on the AA vs 14500 and focus). The smaller barrel of the light is not the standard size for a tactical mount. We have purchased 10 of these so far. The brightness is just right for close tasks like pulling a sliver. The wide focus works better for a night-time tire change or lighting up a room. The strobe is disturbingly bright and is a good alternate to a road flare. The lower intensity is good for enough light to see your way around the house in the dark. Previous winner was the 7w Q5 Mini Cree 300lumen LED. Our favorite version of the Cree LED Q5 was the Ultrafire. That unit is also inexpensive, but dim compared to the Kootek. Overall this is a good, affordable flashlight. We recommend you combine the Kootek with rechargeable AA batteries and a good AA charger. Rechargeable batteries and a good charger can easily pay for themselves in a few years, and save you a lot over time. Nitecore Tini 380 better for EDC. Keychain flashlight, smaller, lighter and brighter but more expensive (about $30) and re-charges using micro USB. Lumintop EDC01 smaller, brighter, more expensive (about $11) AAA flashlight- not as bright as the TINI380. Sofrin SF14 or Lumintop Tool AA (both are about $17) and produce the same lumens with an AA battery, are really bright with the 14500 3.7 battery, and the cases for each are very similar. For information on rechargeable batteries and battery chargers for your cheap flashlight, check out “Best Battery Chargers and Batteries” post. 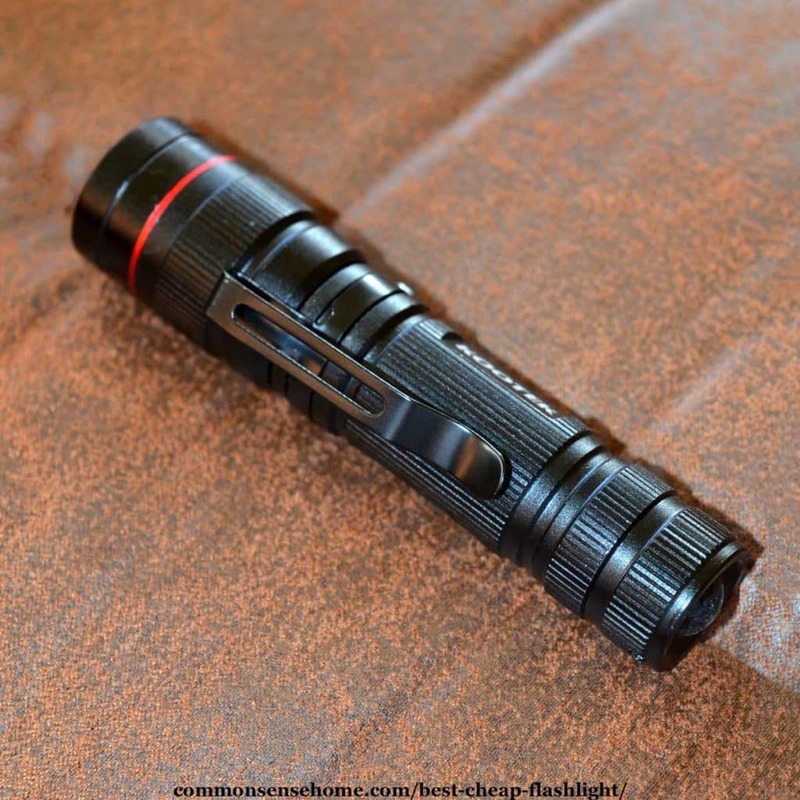 The post “Brightest Flashlight – AAA, AA, Tactical, Keychain and Spotlight” features more info on the brightest flashlights in several different categories. See also: “Electromagnetic Pulse (EMP) – What You Need to Know” for info to protect your LED flashlights from EMPs. Originally published in 2014, updated at least annually. Last update: Nov 2018. So if I am understanding this correctly, this would be a great every day use flashlight but not a tactical one. Is that correct? Thanks for a helpful review. It depends what you mean by “tactical”. You’re certainly not going to be clubbing someone over the head with this (but it won’t break if you do hit someone with it). It’s not big enough to shine for deer, illegal aliens or zombies across a 40 acre field, but it is a a solid, multi-function light. It has a narrow and a wide focus, good lumen rating, and strobe function – pretty much anything I’m likely to need in a light in most scenarios. It can be mounted to a weapon. Thanks for the review. I have purchased some of these type of lights in the past. I keep them placed around the house in case I need them in a pinch. They work just fine for what I intend them to be. However, you get what you pay for. I have thrown several of these lights out because they just die. I would NOT use these as something to rely on in an emergency. 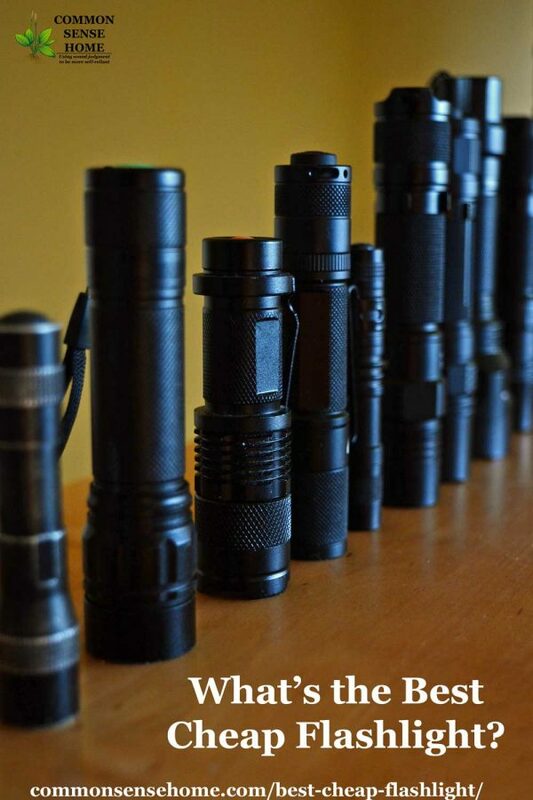 Fine if you buy a bunch as a backup, but you should still buy quality flashlights as your primary emergency lights, whether it be in your car, house or as an EDC. If you spend $25-30 on a similar type light from a well known manufacturer, there’s a much greater chance it will perform when you need it to. Sure, you could buy 5 of these other lights, but you’re not going to carry around all 5 to make sure one of them works for you. We do have some sturdier, more expensive flashlights, too. We also have teenage boys, who have a bad habit of “borrowing” things and not getting them back where they belong. If these go missing, it’s not a big concern. We’ve had these for about half a year, and so far, so good – better than the similar under $10 models we have tried in years past. I have been using these since over 2 years ago n they are all working good. I have 2 in car, along with a bunch of batteries since they last like 1-2 hours on high per battery. Hello, great article on the ultrafire q5. This is a good flashlight for the price. Personally I would rather spend $15-$20 more bucks and get a flashlight that was a bit sturdier. This is a great flashlight if you need more than 3 or 4 lying around but I think that most people would be better off with a $25-$30 dollar light. If they don’t have an issue in their household with flashlights disappearing, I would absolutely agree. My husband and I both get a lot out of these preparedness articles! And he can’t resist a cheap flashlight, but a couple of cuts above that last more that a week would be ever so practical, so thanks! I have discovered that a band of bright red vinyl tape on easily mislaid or hidden tools will stand out in a patch of grass or junk quite well. I clean off the patch to be taped as well as possible before applying. We still find rusty, color neutral Japanese sickles quietly rusting on stumps or behind rocks once in a while. Haven’t had to replace a lost one in the two years since I started banding them. The bright “process blue” handle on my Cobra sickle also stands out quite well in the garden and peeking out from under junk. If it is something that gets used at night, I have begun to add a strip of holographic reflective tape as well as red tape to tools that tend wander off at night. I guess you wouldn’t want to make tactical tools stand out at night. Maybe those would remain accessible longer clipped to a tool belt or harness and diligently re-attached after use. Agree totally with this review,only I have the 2000 m/ah eneloops and the bc700 charger. The best of the group is the Sipik as it has better machining than the clones I have from ebay.The sipik is available for under 5 dollars at DXextreme right now.However,the clone is still a workable light and in the 3-4 dollar range,it just cant be beat for value. Its a great light,and will light the tops of pine trees across the street so its a heck of a light for the price. Great review,folks,listen up,the recomendation here is spot on the money for value and usability.All the equipment listed for the whole system is top quality re/charger and batteries. The UltraFire Q5 is great cheap led flashlight. I have one for two years and now it still works well. I started a tradition years ago, back with Y2K. Every year everyone gets a new flashlight with batteries in their Christmas stocking. It started with the cheep plastic 2D ones that the batteries leaked and ruined them about April. Now I get them from the “harbor” store for free with their coupons that seem to be in every magazine I read. For years the kids to poked fun at my annual stocking stuffer and I heard “look Y2K didn’t happen, again this year”, but last year I overhead one teenager say, I can’t wait for Christmas, I need a new flashlight for my car. While the Cree is a very acceptable light and the “mag” family is professional grade. The little led ones I’m giving the kids are meant to use and loose without angst. Yes there are lessons to teach young ones to take care of their equipment so it will take care of them. but there is also reality that “stuff happens”. I keep several all over the house and have a box in the garage that hold the new “free” ones till I need one or its December. I also recommend placing a small nail or cup hook to back or side of your nightstand and hang a mini flashlight there. You can Velcro it to bed frame rail if there’s no room behind the nightstand and let the covers hide it. No fumbling through drawers looking for one. It’s where it is till its not, then out to the garage for another one. I was just talking to my husband about this post the other day, and he noted that he should really update based on his recent experience. Last week on his way home from work, a car ahead of him hit a deer. They drove off, but there were chunks of deer and car still left in the road. My husband and another driver pulled over to clear the roadway, and he used the strobe function on the flashlight to help warn traffic. It worked pretty well, but he said he wished he had two more flashlights in glove compartment, because then he could have set them around the entire area like flairs. I just ordered several more units so he’ll be able to have his glove compartment stash. My eyes struggle with depth perception. I am notorious in my neighborhood for working lase into the night in certain seasons to get trees planted or fall crops covered before a frost. Or when weeds are disastrously bad. In doing so I have discovered that two sources of light, one on my headlamp and one from another direction that I do not have to face while working, will make it much easier to see and work with my project. A flashlight helps with a small area, a clamplamp worklight or car headlamps make walking about much safer. A good bug veil, hat and bite-proof work gloves also make the job much easier to perform. I LOVE these flashlights. I always add one to my order whenever I get anything from Amazon. Best sub-$10 flashlights I’ve ever used. Hi people,,, hey where can I get a remote pressure switch for this flashlight? Such pressure switches are widely available, but I suspect this flashlight may not be well suited for the application you have in mind. The spring is not sturdy enough for gun mount. Each recoil will change which mode it’s running in, and also turn it off. “Maybe” you could wrap a wad of copper wire into the spring to give it just the right travel to compress with no slack and eliminate the issue, but that’s a fiddly thing to do and rely on in a scenario involving firing a gun. There is no reason to pay more for the Ultrafire brand of this. It’s commonly called an SK-68 and you can bid/win them all day long for $2 to $3 on eBay. Heck if you’re going to pay $5 you can get it from a US seller in less than a week instead of closer to a month from a Chinese merchant. You wrote “not all of them use the Q5 LED” but that’s not really a luxury LED or anything, even an off brand can easily produce 150lm. As for 3 mode, decide for yourself. I hate the 3 mode version that always starts out in flashing mode, WTF were they thinking?!! Anyway, while they are easily the best quality and great value to be had for around $3, they are unnecessarily bulky for only 150lm and now that everyone has switched over to using Eneloops or Li-Ion for flashlight power, it still may be worth spending a few bucks more to get near 1000lm. Why settle for much dimmer than that when the cost difference is only what you’d pay for a couple lunches at a fast food joint? Suit yourself but I see no reason to be THAT greedy about a basic household tool like a flashlight. After all, once you have a nice, really bright light, all the lesser ones just sit around collecting dust. I’ve probably had 8-12 of the “mini Cree LED Flashlight” just like the ones in the photo above, kind of lost count over the years. They are great in the beginning. But on every single one of them, after a few months or perhaps a year, the switches start becoming unreliable. You end up having to lightly tap them on something to get them to switch on. Every single one. Thus I end up on this article searching google for “best inexpensive flashlight”. We still have the original Cree we purchased back in 2014, and no switch problems to date. We did include an assortment of different styles for those who are looking for other alternatives. Thanks for the review. I like Q5 mini Cree 3 mode LED flashlight. It’s super mini and cheap. Special, Lumens is up to 1200. Just bought this bad boy last week. I’m really impressed with the quality for how cheap this light is and you get 5 in a pack! Was using the UltraFire for my EDC before..but I might just switch to this one.